Fort Wayne, IN - The Fort Wayne TinCaps, in conjunction with the San Diego Padres, have released their preliminary roster for the 2013 season. 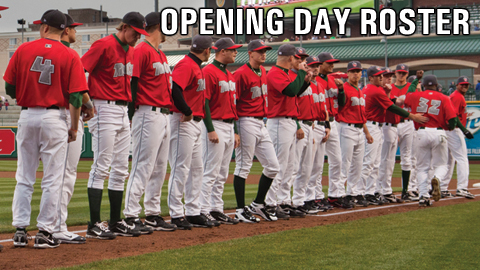 The TinCaps open the campaign on Thursday, April 4th, at Dow Diamond in Midland, Michigan, as they visit the Great Lakes Loons. Click here to see the roster. Fort Wayne's roster features a projected starting pitching rotation comprised of four first-round or supplemental first-round draft picks. Returning pitcher Joe Ross, the 25th overall selection from the 2011 draft, will be joined by 2012 first rounders Max Fried (7th overall), Zach Eflin (33rd overall) and Walker Weickel (55th overall). Justin Hancock, a 2011 ninth-round selection who appeared in 13 games with Fort Wayne in 2012, and Tayron Guerrero are slotted to round out the group. Second-year Manager José Valentín, along with first-year pitching coach Burt Hooton and first-year hitting coach Morgan Burkhart, will oversee a roster comprised of 13 pitchers, two catchers, six infielders and five outfielders. The roster contains five of the top 30 prospects in the San Diego farm system according to Baseball America: pitchers Fried (2nd), Weickel (12th), Ross (14th), Eflin (16th) and outfielder Mallex Smith (28th). Valentín's 2013 club begins the season with eight players who saw time in a TinCaps uniform in 2012, when the team reached the Midwest League Championship Series. Brothers Erik and Felix Cabrera return, in addition to pitchers Ruben Mejia, Hancock and Ross. Outfielders Corey Adamson, Jeremy Baltz and Alberth Martinez are also back for another stint at Parkview Field. Fried, 19, was selected by the Padres out of California's Harvard-Westlake High School, where he was teammates with Lucas Giolito, selected 16th overall last June by the Washington Nationals. The 6'4" lefthander signed with the Padres, turning down a scholarship offer to play collegiately at UCLA. Eflin,who will turn 19 on April 8th, is a 6'4" righthander from Oviedo, Florida. He was selected in the supplemental first round. Eflin pitched in four games last season for the Arizona League Padres after signing his contract. Weickel, also 19, stands at 6'6" and was selected in the supplemental first round by San Diego out of Florida's Olympia High School. In his pro debut season last year, he went 1-3 with a 4.50 ERA in nine games with San Diego's rookie-level club in Arizona. Ross, who made six starts with Fort Wayne last season, returns to the mound at Parkview Field. The former UCLA commit's older brother, Tyson, was acquired by San Diego this offseason. Jeremy Baltz, an outfielder selected from St. John's University in the second round of the 2012 draft, returns to Fort Wayne after appearing in five playoff games with the TinCaps last season. Outfielder Mallex Smith, who is rated by Baseball America as the fastest baserunner in the Padres farm system. Smith was a fifth-round pick out of Santa Fe (Florida) Junior College, where he stole 31 bases in 37 tries, and went 17-for-21 in his first professional campaign last year. Catcher Dane Phillips, selected two spots behind Baltz last year in the second round. The native Texan hit .226 in 69 games with the Eugene Emeralds (Padres' short-season club) last season, hitting four home runs and driving in 30 runs. Infielder Maxx Tissenbaum was a college teammate of 2012 TinCaps outfielder Travis Jankowski at Stony Brook University, which reached the College World Series last year. Tissenbaum, a native of Toronto, Ontario, Canada, played 43 games at second base for Eugene last season, hitting .296. Former two-sport athlete Brian Adams, who played both football and basketball at the University of Kentucky. UK is the alma mater of former Fort Wayne players Chris Bisson (2011) and Sawyer Carroll (2008, 2009). Adams follows the path of 2012 TinCaps shortstop Jace Peterson, who played both football and baseball at McNeese State University. Corey Adamson, an outfielder who played in Fort Wayne in 2011 and 2012, returns to the Summit City. Adamson signed with the Padres at age 16 as a non-drafted free agent out of Australia. This offseason he hit .321 for the Perth Heat of the Australian Baseball League and played for Australia in the World Baseball Classic. Reliever Roman Madrid converted a Northwest League-best 13 saves last season for Eugene. In 37 1/3 innings last season, he struck out 44 and walked 11, compiling a 2.89 ERA. Madrid, selected as a catcher in the 2009 draft by the Cleveland Indians, was a seventh round selection by the Padres out of the University of Central Florida last June.